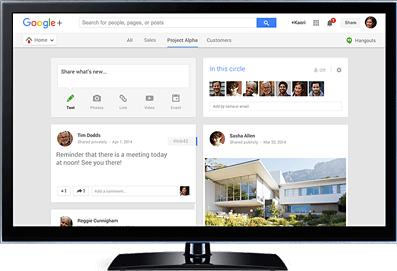 G Suite (Google Apps) is a cloud-based productivity suite that helps you and your team connect and get work done from anywhere on any device. It’s simple to setup, use and manage, allowing you to work smarter and focus on what really matters. With easy access to their information on the go, employees can be productive with Google Apps even when they’re not at their desks. Gmail for business offers 30 GB of storage per user, powerful spam filtering, interoperability, and a 99.9% uptime SLA. Email, IM, voice and video chat Each user gets 30 GB of email and IM storage (50 times the industry average). Anytime, anywhere access to your email Gmail is securely powered by the web, so you can be productive from your desk, on the road, at home and on your mobile phone, even when you’re offline. Get less spam Powerful Gmail spam filtering helps you stay focused on what’s important. Postini filtering lets you customize your spam protection. Personal, resource, shared, and public calendar services. Easily schedule appointments Overlay multiple calendars to see when people are available. Google Calendar sends invitations and manages RSVPs. Integrate with your email system Google Calendar is integrated into Gmail and interoperable with popular calendar applications. Share project calendars Calendars can be shared company-wide or with select co-workers. A range of sharing permission controls help maintain security and privacy. Access with your mobile device View and edit event details, add new events, and invite guests on mobile devices like the BlackBerry and iPhone. Even receive calendar notifications via SMS. Publish calendars Publicize external company events by publishing a calendar to make it searchable in the Google Calendar gallery. Easily embed calendars into web pages. Online documents with real-time collaboration. Anytime, anywhere access to your work Google Drive is securely powered by the web, giving you the flexibility to be productive from your desk, on the road, at home and on your mobile phone, even when you’re offline. Works across operating systems Google Drive on your Mac, PC or mobile device (or your browser) gives you a single place for up-to-date versions of your files from anywhere. In addition to any file type you choose to upload, Google Docs are also stored in Google Drive. Easily upload and share files Share individual files or whole folders with individual people, your entire team or even customers, vendors and partners. Create and reply to comments on files to get feedback or add ideas. 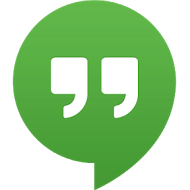 HD video meetings with your entire team Host Hangouts for up to 15 people within or outside of your organization. The screen automatically focuses on whoever is speaking and intelligent muting prevents background noise. Easy to use from anywhere Your entire team can join the same Hangout from their desktop, laptop, tablet or phone with the same easy-to-use experience. Built-in screen sharing Review your latest slides or give a remote tutorial with easy screen sharing, then send around useful links with built-in chat. A public platform for showcasing your brand Hold a public Hangout On Air to demo a new product or make an announcement. 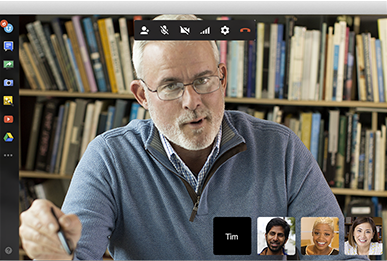 Your video conference streams live in HD and is automatically saved to your YouTube channel. Integrated with calendar, so it’s only one click away When creating a meeting in Google Calendar, you can automatically add a Hangout. So when your meeting rolls around, it takes just one click to join. Custom control for admins Set advanced admin features like limiting access to Hangouts for external participants, turning chat history off and the ability to eject participants ensures privacy. Bring insights and answers together Google+ has the perfect audience for every question or idea. Share your thoughts with a specific Community or share a question with your entire organization. Filter content to find what’s most relevant to you Organize your social connections in a way that is unique to you. Filtering helps make sure you hear from those that inspire you and share with those you want to hear you. Integrated into your workflow Google+ integrates perfectly with your email, calendar and docs to help you work smarter. You can filter your inbox using Circles or post a survey to get instant feedback. Privacy controls keep your posts secure With enhanced privacy controls, you can pick default settings for different groups, like one for your internal teammates, and another for external vendors. Photos and videos bring conversations to life Google+ is a great way to share the latest demo video, screenshot, product photo or any rich media that is relevant to your followers. Share, connect, and interact on the go The Google+ app for Android and iOS lets you share on the go. Share locations, photos you’ve snapped on a business trip and have them instantly saved and ready to share. Security first Google Apps for Government includes dozens of security features specifically designed to keep your data safe, secure and in your control. This segregated system, for government customers in the U.S. only, was the first cloud-based email application to receive FISMA accreditation from the U.S. federal government. Your data belongs to you Apps tools enable you to control it, including who you share it with and how you share it. Google’s data center network provides exceptional security and guarantees* reliable access to your data, 24x7x365. Unstoppable innovation at Government Agencies Empower your employees to securely collaborate and deliver amazing products that win in the marketplace.